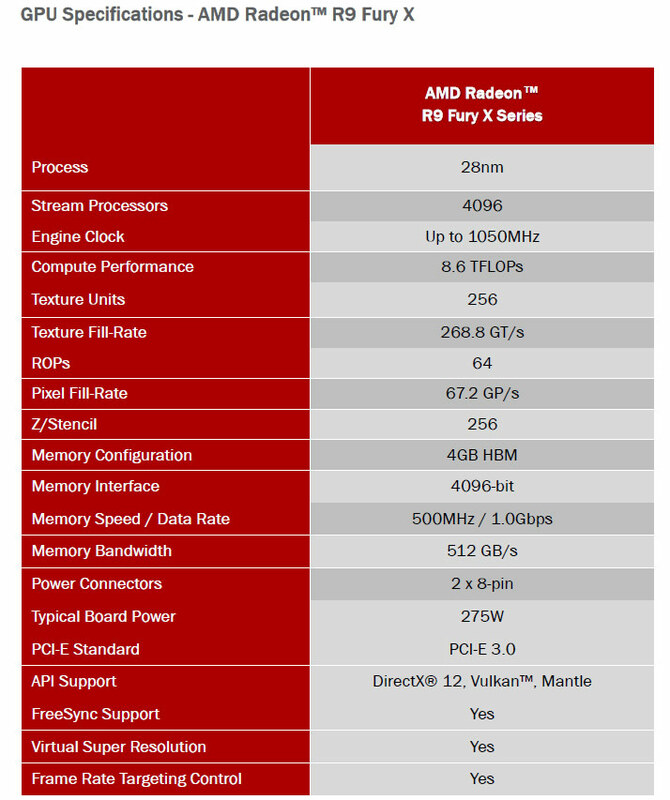 The AMD Radeon R9 Fury X was announced earlier this week and and even the benchmark numbers by AMD have been published. One of the last things left to do is to tear down the card and show you what makes up the latest flagship card from AMD. The PCB for the AMD Radeon R9 Fury X video card is just 7.6-inches in length making this water cooled card the smallest flagship graphics card that we have ever seen from either AMD or NVIDIA. 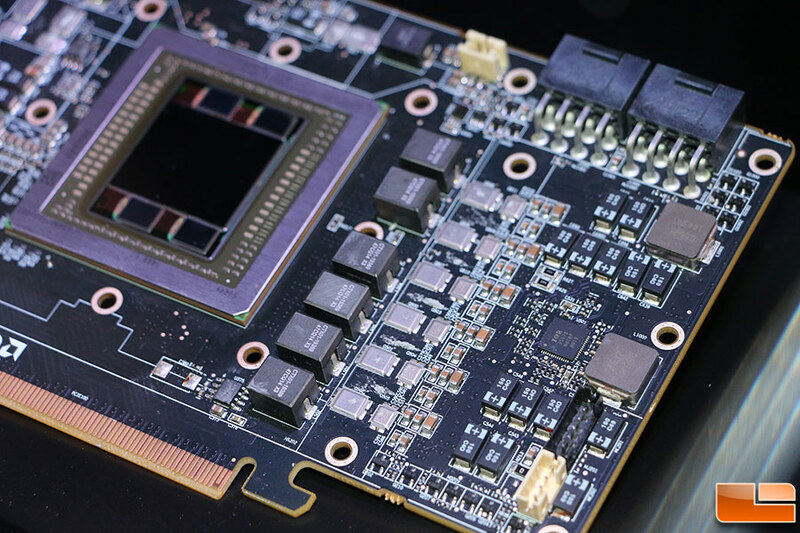 The Radeon R9 Fury X has a 275W Typical Board Power rating, but the two 8-pin PCIe connectors and the PCIe x16 slot itself means that the card can easily pull 375 Watts if so needed. 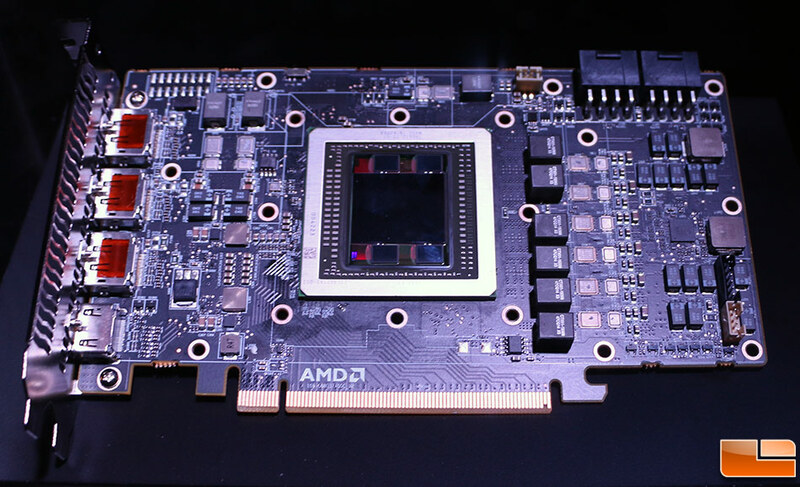 In the image above you can better see the 6-phase power delivery solution that AMD went with on the Radeon R9 Fury X video card. AMD said that this design is capable of delivering 400 Amps of power to the GPU and HBM! 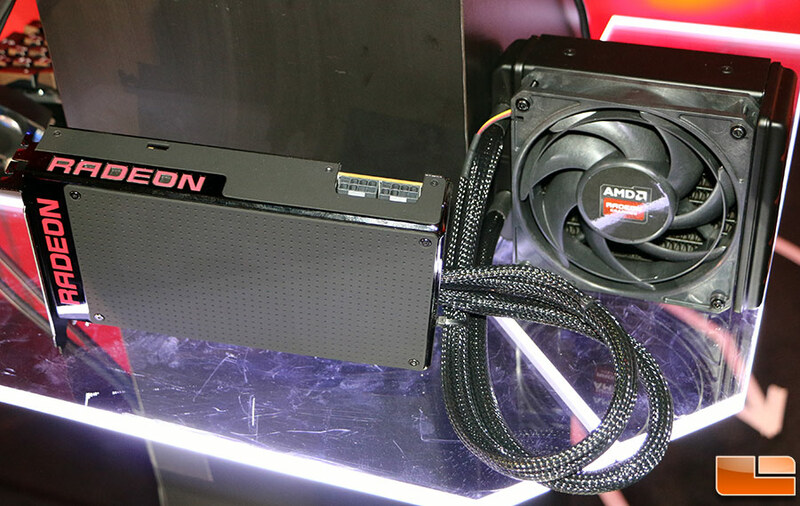 Let’s take a closer look at the AMD Radeon R9 Fury X video cards water cooler design that has a thermal capacity of 500W and keeps the Fury X at just 50C during typical gaming sessions. 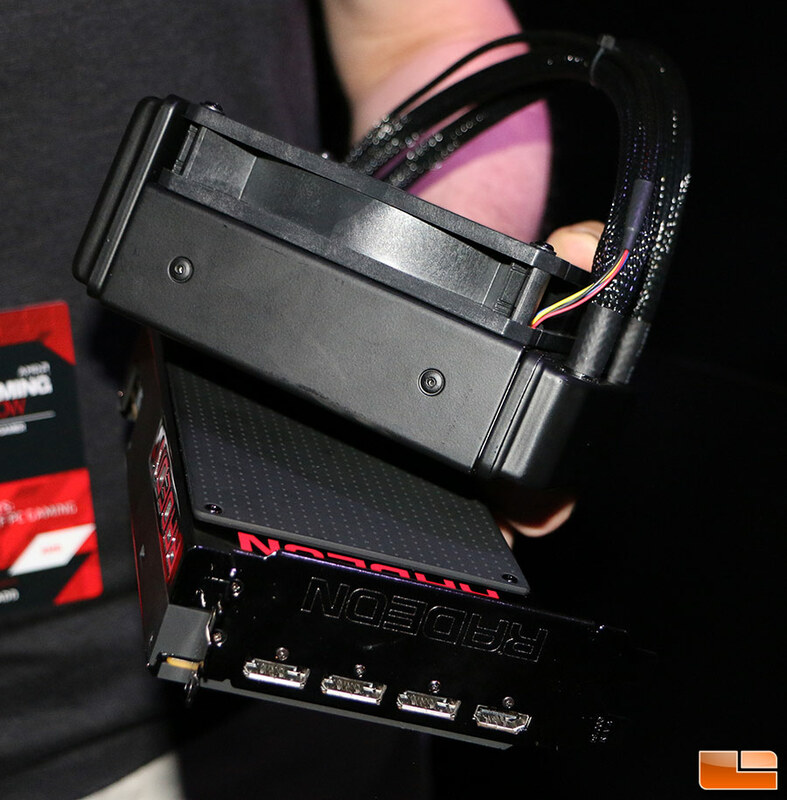 The images above show the AMD Radeon R9 Fury X GPU Cooler that is under the metal housing on the card. 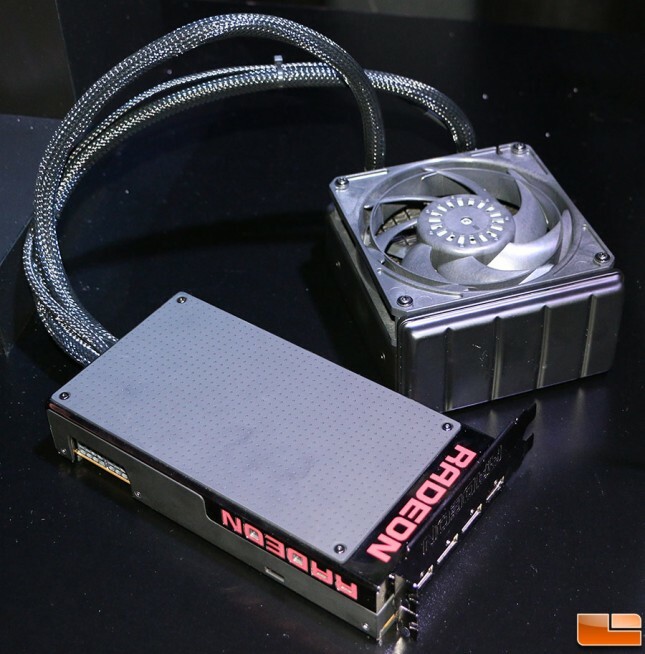 AMD selected Cooler Master to come up with the reference design cooler on the Fury X and it looks to be pretty well built. One of the copper water pipes is also flattened at one point to make contact with the Radeon R9 Fury X’s power components to help keep them cool as well. From what it looks like both the GPU die and the HMB memory make contact with the waterblock itself. 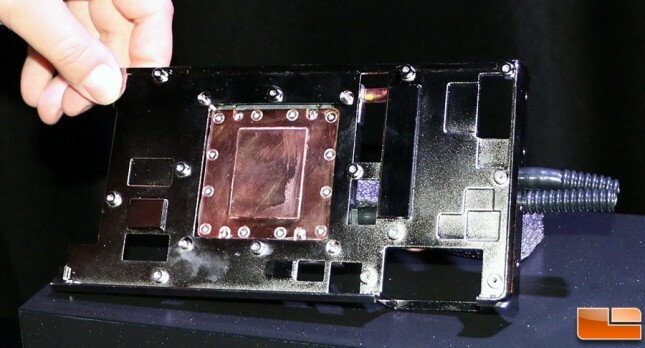 The AMD Radeon R9 Fury X appears to have a full coverage water block right from the factory! The GPU and HBM appear to be close to the same height, but nothing too drastic or something a little thermal paste can’t even out. Notice in the image above that the GPU was ‘made in Korea’ according to the metal die protector ring. 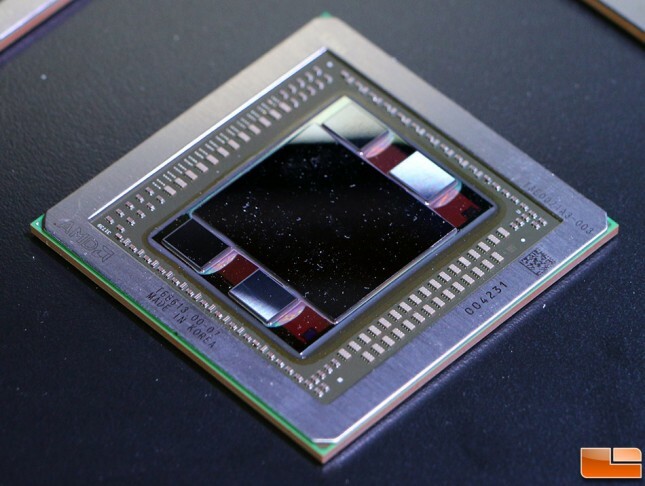 It appears that AMD is sending the GPU dies from TSMC to SKHynix in Korea and having them assemble the GPU and HBM onto the interposer and the overall silicon package. The 120mm Radiator used on the features a unique reservoir on the side of it that actually extends below the cooling fan. This extra space allows for more coolant to be used and AMD says that it really does help performance. AMD is using the ribbed hard plastic line that has anti-kink properties, so it is somewhat flexible and shouldn’t kink up when routed in your system. 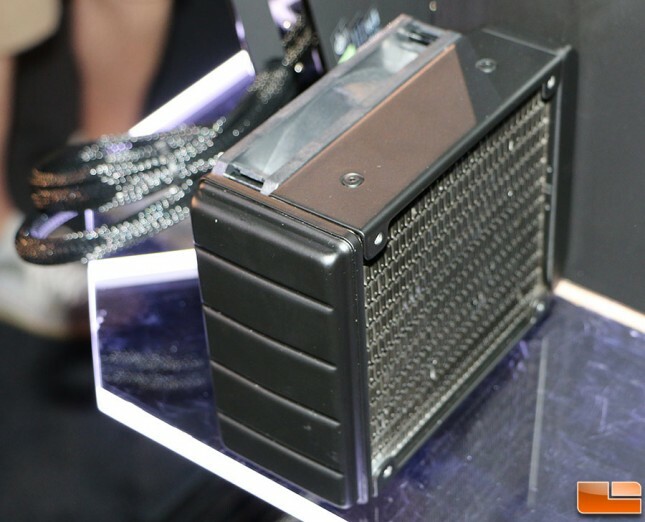 The water tubing is 400mm long and has been individually sleeved, so you’ll have two 400mm long connectors going between the card itself and the radiator. You’ll also have a 400mm long sleeved cable for the cooling fan. AMD went with a Scythe Gentle Typhoon 120mm Fan that is made by Nidec Servo Corporation in Japan for the AMD Radeon R9 Fury X reference design. We believe the exact model number is D1225C12B7AP-29 as we were told that it tops out at 3,000 RPM. This 120mm fan has a stabilizing ring on the fan blades to help keep noise down and to handle high resistance when used on radiators in applications such as this. AMD sleeved the fan separately from the cooling tubes to allow enthusiasts to change out the fan if they desire to do so at a later time. The radiator uses the standard 120mm mounting configuration and should fit in most any case sold on the market in recent years. We’re anxious to see how the card performs in our own system once we get a chance to test it out.